Today I was reading through some of my pre-blog randonneuring rides and came upon this story of the Gray Ghost Riders flèche from 2006. It was my second flèche, and one of my favorites. 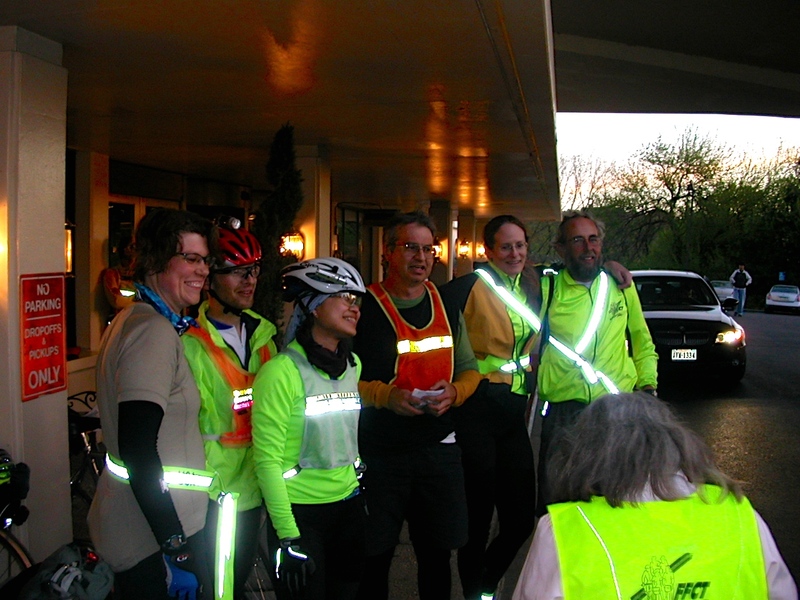 Given that our club, the D.C. Randonneurs, just ran its 2014 flèche over the weekend, I thought this an ideal time to share the Gray Ghosts story. And by the way, congratulations to all the DCR flèche teams! Friday evening the team of the Gray Ghost Riders (Steve A., Lynn H., Liz, Matt, Paul D., and me) gathered together at Cullers Lane in the Shenandoah Valley in preparation for the next day’s flèche journey. We enjoyed a healthy dinner of spaghetti, homemade rolls from Lynn’s mom, and cheesecake. So far, this flèche was turning out pretty well. After dinner, we noticed Steve looking through some maps. Steve, did you bring maps? Well, yes he had. Wow! Paul and I thought Steve was trying to be a star student and make us look like flunky randonneurs by his bringing maps. Paul said our flèche strategy was “Right leg up, left leg down, left leg up, right leg down.” The team asked Matt, our team captain– if we were going to have a meeting before the ride. “Well, ok,” Matt said. The only recollection I have of business discussed at this meeting was Matt saying, “If something happens to me, at least three of you have to finish the ride.” Well, that is a great way to inspire confidence in your team! We also discussed that we would have 14 controls along the route, more than would fit on our brevet card. So in essence, the Gray Ghost Riders ended up riding with little brevet booklets. Matt assured us the ride would be flat, and we all foolishly believed him. The more I worried about getting sleep the more nervous and farther away from sleep I got. Eventually, though, I somehow managed to drift off. The ride began the next day at 6:38 a.m. Why exactly 6:38 a.m.? I don’t know. We all tumbled out of bed, got dressed, grabbed a bite to eat, and readied for departure. As 6:35 arrived, we asked Matt if we could start, but because Matt was our captain and a very strict abider of randonneur law, he would not allow for it. We impatiently straddled our bikes for another three minutes, and then Matt gave the official word for takeoff. As we departed, the air felt warm and fresh, and the moon was making a spectacular descent. It was a good start to our ride. We rode five miles down the road to our first control and my second cup of coffee. We were making progress now, ha ha! We rode on, talking and enjoying the sunrise. I said we were off to win the flèche. The terrain was rolling and beautiful. The pink dogwood was out, as were many other flowers that I did not know. Liz kept asking Paul what kinds of flowers or plants we were passing, and Paul kept wowing us with his botanical expertise. He tried to tell Liz she was limited to asking the name of three plants on this ride, but she cheerfully ignored that. We made our way past the second control, White Hall General Store, and rode on to the Blue Moon Café in Shepherdstown, West Virginia (mile 56) for some lunch. As we were settling in, Dave B. rode up. And then a few minutes later, Jeff M. and Jeff H. arrived. It was great to meet up and dine with our cycling friends in the Blue Moon courtyard. Everything about the day seemed to have a festive feel. Jeff H. asked me if I was riding the tandem by myself. But no, I was riding my beautiful Rivendell Romulus for this adventure. It was a nice change to ride my single bicycle on a long ride because the fit of my Romulus is so perfect, and it is reassuring to see that my bicycle will move along at a decent speed based solely on my own power. Sometimes when I ride tandem with Ed I worry that I am not putting enough effort into the ride, or that Ed is pulling me along while I am just hanging out watching the scenery go by, so riding my single is a validating experience. We rode on to our next control at Harper’s Ferry, mile 66. Guess who was there!! Our fellow brethren of the flèche, Team Carnivore– Chuck Wood and Crista Borras, Glenn Martin, Chris Mento, Keith Krombel, and Rudy Hewitt. Chris Mento complimented me on my clean Rivendell, saying it was “Felkerized,” as my boyfriend has a penchant (some might say obsession) for clean bikes. Yep, I was looking good! It is funny how excited we all were to see Jeff and Jeff at lunch, and then to run into Team Carnivore. I mean, we all see each other pretty much every other weekend or so, so it is not like we are all long lost friends or relatives. But we sure love running into each other on these long rides. We bicycled on and the ride stayed flat to Matt Settle, and hilly to Paul Donaldson and me. I had pretty much concluded that Matt’s definition of flat did not match mine. However, Crista had perused our cue sheet before the ride and said it would have hills; thus, the topography was not too much of a surprise, and it was an incredibly beautiful route. Our ride took us through the Shenandoah Valley, Harper’s Ferry, Berryville and The Plains of Virginia, and over to Culpeper, before taking us on into our final destination of the Marriot Key Bridge in Arlington. We all rode in each other’s vicinity, if not together, except for a few miles outside of Berryville where Liz took a brief detour. After leaving Berryville, the undulating terrain broke the group up, and I pedaled on with Paul down to the Shenandoah River and up to the next control. Steve asked me if we were winning the flèche yet. Well, of course we were! When we all met up there, everything seemed good, and we were extremely heartened by a gigantic tailwind, which ended up pushing us all the way to The Plains. We then rode over to Warrenton, and another control at a Sheetz. As we left to move on to Culpeper, Matt said, “It’s going to be a little hilly here.” I was not sure how that was going to be much different from what we had been riding or even what that statement meant to Matt, but I kept it in mind as I pedaled up the road. Paul said that we had been sold a bill of goods, because we were told this ride would be flat. A few miles later, as we crawled by Matt going up a little grinder, Paul commented, “Hey Matt, is this the flat part?” Oh, we randonneurs are a funny bunch. Paul and I watched the sunset and kept trying to remember our strategy–what was that again, Paul? Left leg up, right leg what? Oh right, right leg down. The colors of the sky were beautiful, the air cooled slightly, and it was a perfect time for riding. After dark, we passed by an outstanding bonfire that lit up the sky in what felt like the middle of nowhere, and we enjoyed a clear moonlit night full of stars. We kept watching Steve and Lynn’s taillight pop in and out of view as they went up and down the hills. The latter of the three ended up being the most appropriate for Paul and me because we ended up looking at the wrong side of the road for our next cue, which was Chestnut Fork Road. We saw the sign that said Dragonfly Lane, and just kept right on yapping and pedaling. If we had only looked on the other side of the road we would have seen the correct road for our turn. We rode by a big old barn where a live band was playing, and Paul suggested that would be a good control. We rode on for four more miles until we both came to our senses and realized we needed to turn around and get back on the route! Fortunately, those four miles off the route were flat, and we got to the restaurant in the “Nick of Time.” That “Dragonfly Lane” steered us wrong, Paul and I thought — such an innocent sounding little street name, too! Liz had called Ed because no one on the team had my cell phone to get in touch with Paul and me and advise us of our missed turn. I was worried that Ed would be traumatized when he heard the news and be sending out a search team. When I talked to Ed, I discovered he was really traumatized about how long the Easter Vigil he had attended with his daughter had lasted, and that he had not been worried about me. “I knew you were riding with Paul,” he commented later. Ah, good save, Ed. “It’s About Thyme” was a great stop, with cheerful, fast service, and delicious food. The restaurant even locked up our bicycles in an adjoining building so that they would be safe while we dined. We were able to use that as our own private changing space to layer up and prepare for the evening riding. From Culpeper we set out toward Manassas. Lynn stated that after her big dinner she was certain she was full, but ten miles down the road she said she was hungry again. I felt the same way. And with all the controls we had, there were plenty of opportunities for glamorous gas station dining. I could not believe it, but after Culpeper, the ride actually mellowed out, and we enjoyed miles and miles of flat terrain. It was a nice change. Paul said that this was the flèche terrain we were promised. We were living it up now! Matt or Liz had a flat tire somewhere along the way, but we waited up for them, ate a few chocolate covered coffee beans that Liz had provided us the night before, and rode on. We had a bit of a stretch on Route 28 that was a little narrow and busy, but we gritted it out and rode into Manassas. As we came into town, Steve, Lynn, Paul, and I took a bit of a wrong turn, and guess who came to our rescue. Steve with his maps!!! Now, Paul and I were thinking that Steve was our favorite randonneur, and he quickly got us back on route to our next control. Way to go with those maps, Steve! We then cruised on to the 22 hour control at mile 213.4, and had a little time for hanging out, dozing, and feeling generally loopy. Of course, Matt was very strict about our 22 hour control, and only allowed us to leave at exactly 4:38 a.m.
We had one final control at a McDonald’s 8 miles further on, and Matt had to beg the woman behind the counter to sign our cards. She was reluctant to put her signature down on anything. Matt pleaded, “We just need you to sign to say that we were here. Do you see us standing here? Don’t you agree that we are here? Now, would you please sign this little box that says we were here?” I was wowed by Matt’s powers of persuasion. It felt like we were racing into the Marriott Key Bridge, but every time I looked at my speedometer it read 12 miles per hour. Maybe this thing is broken, I thought. Alas, it was only my legs that did not work at that point. We maneuvered through the pothole-strewn Route 50 and Wilson Boulevard, and enjoyed the Clarendon Boulevard downhill to the finish. When we arrived, Team Carnivore was in the parking lot to greet us, as were Andrea (wearing her festive bunny ears from last year’s flèche) and Ed and his seven-year-old daughter, Dagny. Dagny had even brought me a big Easter basket with candy. I shared some of my Easter treats with my flèche teammates and reveled in our triumphant flèche arrival. We all ate breakfast, and Paul started readying himself for his ride back out to Middletown, Maryland. He said to me that he had started this weekend with a plan, and he was going to carry out that plan. I had a plan, too, and my plan involved sleeping. Paul thought I should try and stay up the whole day, but I thought that was the worst suggestion I had heard in a long time. I asked Paul if he thought I was still a randonneur “trainee with potential,” as he had labeled me on the Richmond Roundabout. Paul said that I had graduated, and was now a sophomore trainee. Woo hoo! I felt a swell of pride– I am making some randonneuring progress. The beautiful route, perfect weather, and great company all combined to allow us to win the flèche! The rest of the day (when I was not sleeping) I felt completely satisfied. We had successfully ridden our brains out for twenty-four hours. All of us, but Paul, that is. He was off to get in another 80 miles. Hi Joan, I don’t subscribe to Bicycle Quarterly and would definitely like to see the article. Regarding cameras, I use both the Canon S95 and the S110. Both are the same size, although the S110 is the updated version of the S95. Either camera is easy to stash in a handlebar bag or even a pocket. I find it works well on automatic settings, which is good for on-bike point-and-shoot photos.